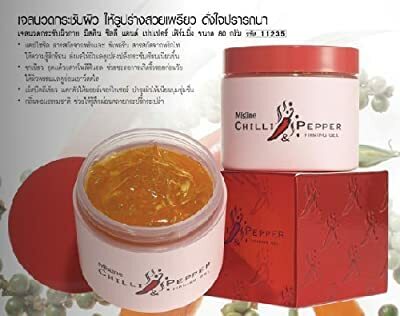 Mistine Chilli & Pepper Body Fit Firming Slimming Reduce Cellulite Cream Gel with Chili, Pepper and Green tea extract, will moisture and renew your skin to be smoothen, glowing and firm. Direction: Apply the firming gel on the abdoment, waist, hip, upper aim, thigh calf and require area. Massage and pat the gel absorb into the skin and leave on for 10-15 minutes. Rinse off with water. Use 1-2 times daily. You are recommended to do an exercise during using the gel. Product from Thailand Size : 80 G. Shipping with Tracking ID" Brand New,Guarantee 100% Genuine Product, Satisfaction Guaranteed, Worldwide Shipping Quickly . Buy with Confidence! Thank you for your order.